While working on a project in collaboration with Marina 101, we realised that a countless number of people express dissatisfaction over either the lighting systems in hotels or the quality of lighting in their rooms or other areas of the hotel. As a result of this, hotels fail to provide the best experience that they claim, to travelers. 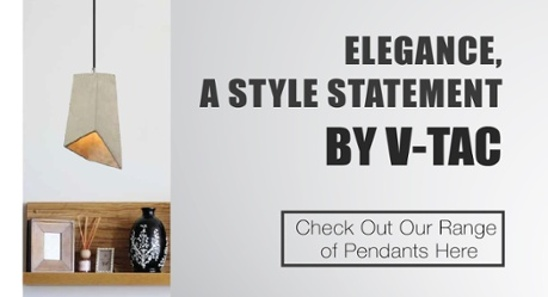 At V-TAC, we've got an extensive range of "state-of-the-art" decorative fixtures, bulbs, and holders - and we understand that lighting is associated with moods. This is exactly what hotels need to focus on! While pursuing this goal, many lighting designers tend to lose focus of what's important. Don't worry, we've got you! This post comprises of the top 4 things you need to direct your designs towards. Let's begin! 1. Observe the area to match lighting with the concept - Different areas around the hotel must have different features and styles. Use lighting to highlight the style of these areas or to make a statement about the place. Be careful though! Use the right tones and colors to match the setting and concept of the area. Over-dramatization can be a put-off. 2. Spotlight or Bulb? - Manier times, designers are confused about which fixtures or lamps to use in an area. Hotel rooms must have different fixtures in different areas of the room to suit the needs of the guests - the lighting should be bright enough in the restrooms, comfortable around beds and the room should have ample task lighting around the workstation. Restaurants usually have different lighting in comparison to pool areas and bars have different lighting in comparison to hotel rooms. Be aware of the fixtures and lamps you need to use to provide the right mood. 3. Devote your design to quality - Quality lights is what will sustain your design. The quality of the lights you choose will depict the lifetime of your design. The lower the quality, the faster the lights will die out, resulting in higher maintenance costs. Investing in higher quality will result in high ROI's in the long-term. Which leads to my last point..
4. Go GREEN, go LED - With the latest trends in technology, it is no surprise that LEDs have taken over the lighting industry. They are affordable yet practically the best choice out there. The ROI is commendable and so is their quality of light. That's not it! You don't even need to change your existing fixtures - there are so many stylish LED bulb and spotlight replacements to choose from! 5. We're always here for you! - we've got one of the widest ranges of exciting LED products and accessories. You will never run out options while going through our product range.